Successfully Added eCigar - 007 Electronic Cigar to your Shopping Cart. Introducing the 007 eCigar that comes with 24 different nicotine density cartridges. Designed to look Realistic with glowing red light when inhaled, along with harmless artificial smoke. The inner body of the eCigar is made with stainless steel and the outer layer with molded plastic resembling the look of a real cigar. The cool aspect of this eCigar is the artificial smoke it generates when you inhale, and the red light glows at the tip making the cigar appear real to people around you. Both of these functions are powered by a single AAA battery. In addition, there are 24 cartridges supplied with this eCigar. 6 of 24mg nicotine cartridges, 12 of 18mg nicotine cartridges, 4 of 12mg nicotine cartridges and 2 cartridges with zero nicotine. 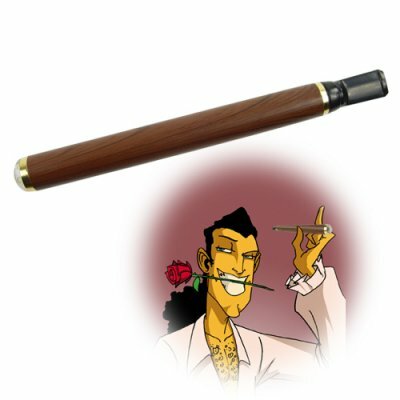 This is a product that can be used for props in movies and TV, it can be given as a gift to cigar lovers who will definitely appreciate the irony, or can be used to help quite smoking if that is what you really want. The eCigar has its benefits for sure, smoking where "NO Smoking" is allowed. This is definitely the most advantageous point that the eCigar introduces. So even if you smoke regular cigars and find your self stuck in a non smoking situation, then the 007 eCigar has your back. This item is in stock now and makes a perfect resale item, either for your business or personal use. The CVJV-H17 is available to you from leader of factory direct wholesale electronics, Chinavasion. Do you also sell replacement cartridges? Yes, if you run out of Cartridges and need some more, contact our customer service team and order the CVJV-H18.